Uglyworld #1797 - Hangovers Cure For Cinko, a photo by www.bazpics.com on Flickr. Hi everyone, is your gooders old buddy Wage here! I was outs with Doug for his afternoon walkies today when I spottereds some randomer lickings the pavements away ups in the distancer. Things like this makers me laugh so mega muchers, so I decidereds to takes a closers look to finds out what exactlies was going on. My laugherings turnereds into concerns when I realisereds it was Cinko that was doing a facedown special on the sidewalks! He didn't even recogniser me and Doug at all, he was completelies out of his minds! I managereds to convincers him to comes back to the cookie cave with me (I hads to promisers him some cookies of course to makes this happener! ), and once there I puts him into his bed for a coupler of hours. 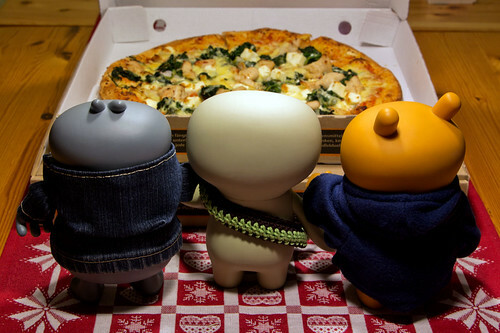 When he wakereds up this evening he was still completelies out of it, so Babo and me decidereds that we hads to sorters him out with our normallers hangover cures, pizza! Thankfullies the littler guy is startings to returns to normal, which is justs as well as he is flyerings to the Uniteds Kingdomer with Baz tomorrow for a coupler of daysies! And don't worries, if there is any pizzas left, you guys will be the firsts to know!